The years seems to tick along at a rapid pace and 2018 has been hectic but very productive and there is notable progress to “Our Girl”. Starting from the front of the Catalina, Bruce is getting close to completing the sheetmetal reconstruction around the nose wheel area. Brett is continuing with repairs to the Port main landing wheel area and Terry F is getting close to completing the repairs to the Starboard main landing wheel area. Steve W has progressed from the Port and Starboard blister area and is moving forward along the Starboard Engineers section. Terry W and Peter are continuing to recondition and repair the main landing gear oleos and wheels along with the numerous associated mechanical components. Terry W is also supervising the volunteers, assigning the many and various tasks and problem solving as required. Henk continues the mammoth task of stripping and repairing the centre wing section, both leading and trailing edges have been removed exposing the main structural frame with his main focus,repairing the corrosion around the fuel and oil tank areas, assisted by Paul and Wayne who are helping to de-rivet, remove and replace the corroded sheetmetal. Warren E and Steve H are continuing to degrease, blast, pressure clean and undercoat the corroded areas and have already coated numerous main landing gear components in the finished colour. Warren T has shown his versatility, assisting with sheetmetal riveting, carpentry skills in the bulky store area and entering data into our computer, logging the work in progress and/or completed components in storage, ready to be re-fitted to the Catalina. Brian has been busy blasting the smaller parts and has moved on to help Barry identify and catalogue the many and varied parts. Colin continues to work from his home workshop, consistently reconditioning and refurbishing the smaller components and has recently finished stripping one of the rotating blisters in preparation for blasting and painting. Giovanni continues to engineer, rebuild or recondition the numerous complicated components destroyed by corrosion, damage or missing from the aircraft. Glenn has the task of reconstructing the wing attach angles and manufacture general sheetmetal work as required. The rollers for the blister top hat sections are 90% complete and we have commenced manufacturing the special curving rollers for the many and varied compound curves of the stringer Z sections, blister sections and chine angle, etc. We are constantly on the lookout for volunteers to help with the restoration and the Catalina Festival, all skills can be accommodated. We are now halfway through the year and the restoration is ticking along with the landing gear oleos away for refurbishment and Warren E and Steve H painting some of the larger landing wheel components in their finished colour and ready for assembly. The landing wheel wells are now the focus, Terry F is removing and replacing corroded sections ready for paint and assembly. Bruce is making very good progress on the front landing wheel compartment, spending many months reconstructing the complicated steel and aluminium sections. Henk has removed the port and starboard leading edges on the centre wing and with the assistance of Warwick and Paul, removing the centre leading edge for repair. We have acquired both a port and starboard leading edge in good condition, which will be fitted up once the repairs around the adjoining area are complete. Steve W and Warren T have re-sheeted the port waist blister area over the past few months and now will move onto the starboard waist blister. Brian continues to use his purpose-built blasting cabinet for small components and found the time to manufacture the roller blanks for the waist blister sections and Bill O completed the finer detail required to produce the top-hat sections. John continues to photograph the restoration in chronological order and assist with the many and varied IT and AV challenges we have. Terry W along with Barry, Rob, Reg, Brett and Peter M are busy with various infrastructure projects, including the container covered area and sun/rain shades for the outer wing sections. many thanks to Col, Giovanni, Marco, Greg and Christine. 2018 is well on the way now with 2017 a distant memory. The landing wheel assemblies have been stripped out and are now in the process of being blasted and painted and their respective housings water blasted, to locate and allow any corrosion to be repaired prior to painting. Most of the interior has been degreased and water blasted in preparation for paint. With the additional volunteers on board, we have had to expedite our infrastructure programme, providing cover for the two outer wing sections and connecting power and air to each work station. A designated paint and blasting booth has been erected, blasting and paint racks manufactured and a new air compressor with the original re-located to the centre wing section. These works have taken more than 50% of volunteer hours over the past few months and whilst this has slowed the restoration of “Our Girl”, it will allow an effective spread of work for everyone in the future. Manufacture of the blisters came to a temporary halt, waiting for the delayed delivery of a powered Swage and Jenny to arrive in the country. New profile rollers are now being machined to enable the manufacture of the “top hat” profiles, specific to the Catalina blisters and then the challenge commences, making the respective fixed and rotating waist blisters and then fitting to the fuselage. This task we envisage will take a minimum of 6 months to complete. I will take this opportunity to thank our volunteers for their hard work and perseverance, providing a solution to every problem that arises, whilst deconstructing and rebuilding this 1930’s vintage Catalina aircraft. There has been a significant increase in the restoration membership since the Lakes Mail article and of course the Festival, with around six volunteers declaring their interest in restoring the Catalina. Some of these people have not yet commenced but the few that have started are excellent. Approximately another six people have indicated their interest for other activities, including photography, canvas painting and offering help with general fund-raising activities. The preparation and paint procedures are now documented and will now be discussed and refined before adding to the “Restoration Blueprint”. We have chosen Valspar paint products for the restoration and the interior paint will be delivered within a month. Pressure-cleaning of the interior is well advanced and on track. The sub-committee meeting to discuss and finalise the paint colour, finish, nose-art, cutaway and PBY-5A vs PBY-5 configuration was held on 10/11/2017 and completed with nose-art put on hold, cutaways rejected and leave “Our Girl” as a PBY-5A. The Restoration Master Spreadsheet will now require modification to delete the “cutaway” tasks, which will free up hours in the “positive” for the project. Purchase of equipment to manufacture the waist blisters was made and profile wheels will now be manufactured to swage the various sections required. A separate section roller will be built to swage the “Chine Angle” along with the manufacture of the profile wheels. The only outstanding tool required is a special Aviation Pneumatic Hand Riveter which is not readily available in Australia and emails have been sent to a contact in the US to try to get a reasonable second-hand machine. We would expect the “blister manufacture/repairs” to start in earnest by the end of the year, which means it will be ahead of the Restoration schedule. Preliminary discussions have been made with the Volunteer Co-ordinator regarding the management of the Master Spreadsheet, particularly planning for the extra volunteers now on board. Most of the Infrastructure work has now been completed and we are well on the way to stocking the parts container with tagged parts, ready for install or further work prior to re-fitting. It is exciting times for the Volunteers, as the Catalina starts to take on the WWII shape with Waist Blisters, Tunnel Gun and Bow Turret to follow shortly after. There has been significant progress made on the refurbishment of our PBY5-A since the last update. Starting at the front of the fuselage, or bow, the complete nose wheel assembly including the gear doors has been removed. 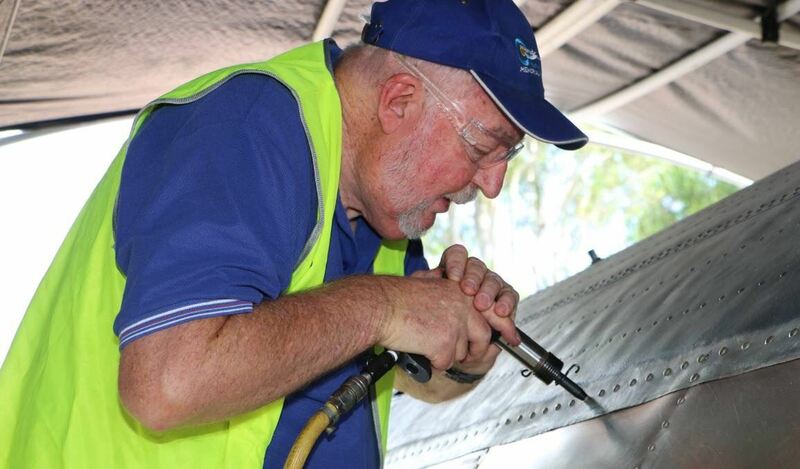 Terry Fahey (T2) is currently working on removing the last of the actuating mechanism from inside the fuselage and then all the components will cleaned, seized and damaged parts repaired as required, primed with two pack epoxy and placed in temporary storage until required. The temporary storage mentioned above is a newly acquired weatherproof and well ventilated shipping container set up with shelving where all repaired components plus other spares and important tooling will be stored. Moving aft a little into the the cockpit and the navigator’s and radio operator’s compartment, Steve Brown and Greg Mewton are removing the last of the internal components such as the control column and rudder pedal assembly. Once again, all the components required to be refitted later will be stored after repair. It is still our intention to eventually end up with a showpiece cockpit and first compartment looking as original as possible. Steve is also continually searching for the various components we do not have, they are all out there somewhere, just need to locate them at the right price. An interior section of the first compartment will be high pressure water blasted shortly to determine how much of the old paint comes off and how much remains. This will hopefully be the procedure to prepare all interior areas for application of an olive green two pack epoxy. All going well, largely due to Warren Easterbrook’s good work, the project has a paint supply sponsor on board which will be a huge boost. Back in the blister compartment, there is much happening. Brian is working on the removal of all the non required windows and associated external sheeting and Ray, Warren and Andrew are replacing corroded external sheeting in the areas where the observation/gunners blisters will be eventually fitted. The repaired fuselage sections in this area are a credit to those responsible, hope the remainder of the aircraft can be of the same standard. As can be seen further in this Newsletter,we have acquired the loan of a set of the blister rotating sections to use as templates for the manufacture of new assemblies. Contact has also been made with people who are experienced in working with and forming various shaped panels for the blisters and cockpit windows and windscreens. A conscious decision has been made to use a fairly high grade aluminium for at least the fuselage repairs. Known as 6061 T6, it is quite good to work with and the finished product looks much better than a cheaper grade. We are working on obtaining this product for at least a reduced price. Thanks also to Hilton Jones for his efforts in sourcing some excellent tooling for us plus the donation of a reasonable size guillotine. The rivet removal tools we now have are making the tedious task of drilling out old rivets so much easier. Finally, Peter, Jim and myself are adding another three metres to the rear of the work deck. Even though the project is reasonably equipped with scaffolding and work platforms, it was found that the area for repair aft of the blister positions was getting out of reach by normal means so Ray and his team have been temporarily moved until a safe work area can be provided. The steel frame including safety rails is well underway and a huge ‘Thank You’ to Chris from Nova Timbers, who has come to the fore once again by providing the timber for the actual work deck. Welcome to three more volunteers, Brian Sherlock, Greg Mewton & Terry Fahey. They bring with them a wealth of experience in sheet metal work as well as vehicle restoration & many years in the aviation industry (in Brian’s case). After years of searching we have finally sourced a genuine R1830 engine work stand. It is now fully refurbished and was on display with our partially assembled R1830-75 mounted on it. Many thanks must go to my good friend Ray Molyneax at the Australian Aviation Museum for his assistance. There has been a huge amount of work carried out inside the Cat fuselage, mainly by Steve Brown but recently joined by Greg Mewton, our latest volunteer. Nearly all the hardware,wiring and associated electrical components fitted post WW2 has been removed, with the fuselage interior looking much more like it should. We are still searching for the original interior corrugated aluminium walkway material, one pilot’s seat plus the engineer’s seat. Please call or email Terry if you know of any PBY components at all, doesn’t matter what condition. A particular grade of aluminium has been decided on for repair of the aircraft in general. For the technically minded, it is 6061 T6 grade, 0.032” or 1.8 mm thick. This is an aircraft grade material but the main reason for this choice was ease of working plus it’s appearance. Ray Fairall, our very well qualified metals specialist was the prime mover behind this. After a search, particular sized off cut sheets of this material were sourced through Ullrich Aluminium, Chantal Nicols, the sales supervisor there did a great job. There is enough of this material on hand to last us quite a while. Our cleaning and blasting specialist will be on site again soon to finish off blasting the top of the centre wing. We are also not too far off having Cliff high pressure water blasting the fuselage interior which will remove all loose and flaking paint. This will be followed by spraying on an epoxy two pack primer which will adhere to and seal the cleaned surface. The final topcoat inside will be an olive green two pack, should look very genuine. All going well, we should have some more hands on patching the fuselage soon,particularly the underside of the hull. Most of this will be somewhat easier than what Ray and Warren are working on now as they are mostly smaller flat sections. Genuine solid rivets are being used wherever possible. Initial plans are also in hand for the fabrication and fitting of the waist blisters and the bow gun turret. Finally, Peter and Terry are well progressed with the temporary cover over the centre wing and we can then really progress some repairs after Cliff has finished cleaning the top of the wing. At least temporary cover against the sun is essential, the aluminium quickly becomes too hot to touch. Planning has also started on how the wing will be turned over, manufacture of higher and more permanent supports and relocating material stored under the wing. Update will be a little different this time, more about people and community groups and a little less about “Our Girl” even though we continue to make good progress. NEW VOLUNTEERS – First up, welcome to Stephen and Jim, our latest volunteers. Stephen is an avionics technician still serving with the RAAF and Jim has a very useful trade background as a mechanical fitter. Interest in the Cat project is definitely increasing, we now have a steady flow of visitors of all ages. The common thread is a veteran in the family but not always. We ensure at least one volunteer stops work and does as much as possible to show off our project and people are always given RCMPA contact details. We have also noted an increase in enquiries from community groups and service clubs. The first group or club to visit were Toronto Lions, they expressed a great deal of interest in what we were doing and presented us with a substantial donation which has proved extremely useful in the purchase of everyday items required for the refurbishment. We would hope that our relationship with Toronto Lions will continue into the future. Valentine Men’s Probus club also spent a morning with us recently and we are receiving some interest from Men’s Sheds. A small group from Bateau Bay Men’s Shed visited recently. Hopefully this will be followed by a larger group. We even had a group on site from the local Fire Brigade a few days ago. The usual format for larger groups is the showing of a suitable DVD followed by a Q & A session, Penny then provides a delicious morning tea followed by a tour of the actual aircraft. Those that are sufficiently agile are also able to have a tour inside the fuselage. Donations are gratefully received on the day although we do not have a set charge for the day at this stage. Just a little on the Catalina, as demonstrated in the photos, the timber deck or work platform around the aircraft is basically complete and we now have a small mobile scaffold set up on the deck which enables most of us to reach the top of the fuselage. No chance of the scaffolding running away, it has braked wheels plus there are stops at the end of the deck. Work on the temporary cover frame for the fuselage is progressing well. Some may find it unusual that we are going to so much trouble to incorporate a substantial work platform, but as the platform will surround most of the fuselage and is in excess of a metre off the ground, it will be invaluable. As well as being able to stand on the platform, volunteers will be able to set up another work platform or scaffolding on it to gain access to the upper fuselage. The platform will be fitted with a safety rail and chains to prevent any mishaps. Our volunteers have been stripping the last of the civilian conversion seating and brackets out of the rear fuselage compartments. This for two reasons: First to gain better access to the area that is presently being repaired and re skinned. (Easier to hold a dolly on the inside on the new rivets). The other reason is that these seats and brackets don’t belong in a genuine PBY-5A. As part of this, the temporary flooring in the rear compartment has been replaced with a much more suitable and substantial material for the safety of all. It is hoped to have the outer wings set up for cleaning, repair and particularly, some maintenance and painting on the fabric covered ailerons in the next few weeks. On site machinery problems have prevented this so far but these should be sorted shortly. Have had a LAME friend of mine examine the propeller assemblies which were fitted to “Our Girl” to determine if they were still suitable to be brought up to airworthy standard. They were also examined by two propeller repair shops and all three have said they can be brought up to operational standard.This gives us another option later if we choose to source old second hand props suitable for static display fitted to the Cat. We also have the logbooks for these assemblies which is very important. Sourced some very useful aluminium work stands and sets of steps of varying heights suitable for use working at various heights around the aircraft. Ray and Warren continue to work on fuselage repairs and are currently making good progress on a major repair area on the starboard rear . Finally, we are looking for a mobile crane suitable for uneven terrain if anyone knows of one suitable. Doesn’t have to be a beauty queen, just safe and functional.